Sous vide cooking is also a hand-off approach. So, you can set it up and walk away, using your time for something else instead. Especially with the invention of wifi enable devices, you can actually “set and forget” your meal, and get notified on your phone when it's done and ready to finish in the frying pan or grill. The term sous vide is French for ‘under vacuum’. But, that doesn’t mean you actually have to vacuum seal your food. Instead, doing that is entirely optional. The key advantage of vacuum sealing is that you’re more likely to get all the air out of bags, without ending up with any water inside them. Additionally, a vacuum sealer will often create a stronger seal. However, it’s also possible to do sous vide cooking with regular zip lock bags. You still need to get air out of the bag but this can be done with water displacement. This type of bag is much less expensive and can be a good approach if you aren’t convinced about sous vide yet. With sous vide, you are cooking food at a lower temperature than normal, which concerns some people. After all, we’ve long been taught that cooking at a high temperature is critical for ensuring that food is safe. But, sous vide cooking is actually safe because of the temperatures that are used. In particular, there is a danger zone roughly between 40°F and 140°F, where bacteria can grow. According to the USDA, food that is in the range for more than two hours risks the development of dangerous bacteria. So, if food is in the zone too long, it could make you sick. There is also a buffer in that range and you typically just need to be above 130°F rather than 140°F. A medium rare steak you can get away with at 129ºF, but most other sous vide recipes will be higher temperature than the danger zone. For that matter, sous vide tends to be safer than conventional cooking methods because there is much tighter regulation of the temperature. This means that you can be certain that food is safe to eat at the end of its cooking time, which isn’t always the case for other cooking methods. Sous vide isn’t the most time-efficient approach to cooking. The low temperature means that cooking takes a long time, and in some cases, you could even be running the machine overnight. For example, a chicken breast may be cooked for one or two hours through sous vide, while you could cook it manually in a fraction of the time. A brisket could take 24-72 hours! But, time isn’t the reason for using sous vide. You can truly get amazing results with sous vide food, especially for meat that is tricky to get right. Likewise, the texture that sous vide offers can be different than any other methods. For example, a poached egg cooked in this way ends up having a custard-like texture. Using any other method tends to overcook the egg (in my experience). Sous vide cooking is different than any other type of cooking out there. So, it shouldn’t be too surprising that you need some specialized equipment. Don't worry – what you need won't break the bank and it's easy to find. In fact, most of the pieces of equipment that you need are things that you may already have around the home. And, the ones that you need to get don’t have to be extremely expensive. Sous vide cooking may sound complicated but there is actually just one piece of essential equipment that you need. This is an immersion circulator. An immersion circulator is a relatively small device that you attach to the edge of a pot or other water-safe container. As the name suggests, the circulator is partly immerse into the water and this is essential for its operation. The device acts by drawing up water, heating it to a specific temperature and them putting it back in the container. By doing this consistently, an immersion circulator is able to maintain a precise temperature throughout the entire duration of cooking. In theory, it is also possible to skip the circulator entirely and just rely on a digital thermometer for a pot on your stove. However, this approach isn’t nearly as safe overall, because your control over temperature is nowhere near as strong. As a result, you could even end up with unsafe food. Additionally, relying on a thermometer would involve constant monitoring on your part, which would be frustrating for recipes that take a long time. It is also possible to pair a temperature controller with a device like a slow cooker or rice cooker and get a similar effect. However, you risk uneven heating with this method and it isn’t as reliable as an immersion circulator. There really is no need to take those approaches anyway. As sous vide cooking, has become more popular, a range of affordable models have been developed, many of which are specifically designed for home use. Because of this, I would only ever recommend a workaround if you are trying to decide whether you like the way sous vide meals turn out. Even then, it’s normally best to simply invest in an immersion circulator right from the beginning. I've reviewed 13 different devices (every one I could get my hands on). You can view my Top 5 immersion circulators here, with mini-reviews of each and links to full reviews within the content. For sous vide cooking, you also need a container where the water will be housed – and the immersion circulator will typically clip onto the side of that. People often simply use stock/soup pots to achieve this. Realistically, the container doesn’t matter too much, as long as it will hold the right amount of water for what you’re cooking. As a result, you need to think about what you’re making before figuring out the container. Even small pots will do. The Joule has a minimum depth of 1.5 inches which is very small, and perfect for a single chicken breast or small pork chop. Many people choose polycarbonate containers but the bigger ones can be bulky. They do make great storage containers though, and will make a great place to store your home sous vide equipment. A water oven is an alternative to using an immersion circulator and a container. Basically, a water oven acts as an all-in-one solution for sous vide cooking and will typically have a control panel that lets you change the temperature and time. Both a water oven and an immersion circulator will give you similar control over the sous vide process. Of the two options, a water oven does take up more space and is less flexible in terms of how much you can cook. However, it will also tend to be quieter, simply because it doesn’t have to withdraw and reinsert the water. At the end of the day, both options are viable and can work well for sous vide cooking. As a result, you can choose which you want based on your personal preference and situation. For example, in a small kitchen, the immersion circulator could make more sense. In contrast, if you aren’t short on space and plan to sous vide cook often, a water oven would result in an easier and more efficient process overall. They do tend to be pricer though, so watch out! Here are my favorite water ovens. 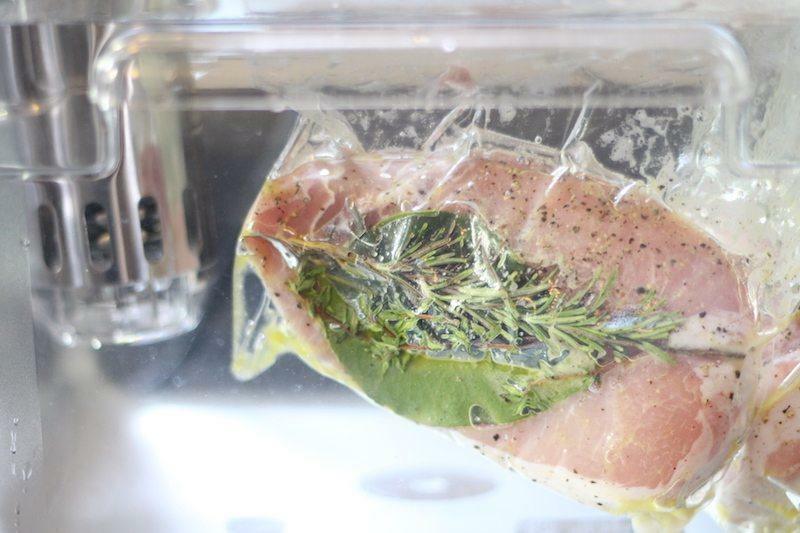 To sous vide cook, you do need bags that you can get air out of and seal. As I mentioned earlier, you don’t have to rely on vacuum sealing here and you can simply use zip lock bags. However, whatever approach you take, you want to be sure that the seal will hold. After all, the bags you’re working with will be immersed in water for hours at a time. If water makes its way past that seal, then your entire meal will be ruined. 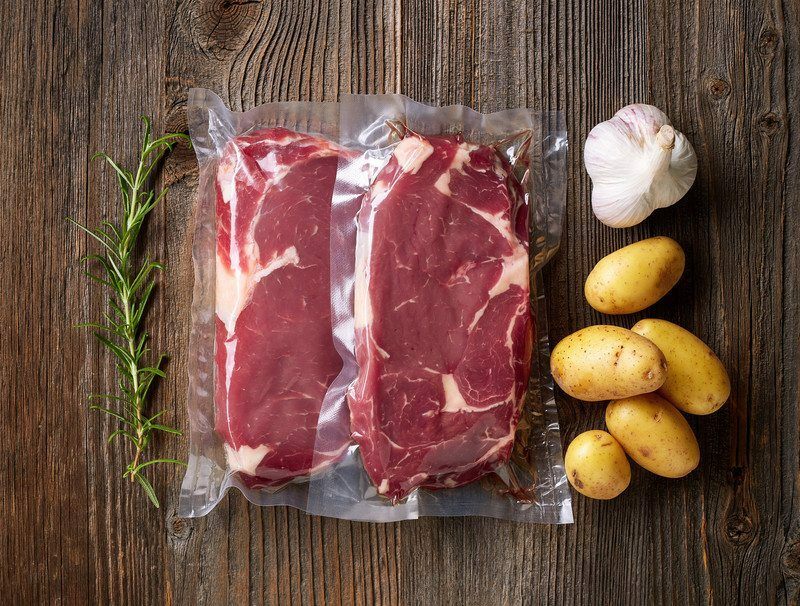 For people that plan to sous vide cook frequently, then investing in a high-quality vacuum sealer may simply make sense. Doing so can help ensure that you get a consistent seal each time and will keep your food safe. If you do take the vacuum sealer route, then you would need to consider what type of vacuum sealer you want. In particular, there are two main options. The first is an external vacuum sealer, which is the most common style in the kitchen. External vacuum sealers can be relatively inexpensive and many of them do produce consistently good seals. However, they struggle when it comes to liquids and moist foods. If you’re careful, you can still seal moist foods with one but liquids simply aren’t an option. This issue would mean that you simply couldn’t vacuum seal bags that contain a significant amount of liquid. The other type is a chamber vacuum sealer. These models are considerably more expensive and are best for people who are willing to invest to get the best outcomes possible. The design of chamber models means that you can actually seal liquids without any issue. The end result is that a chamber vacuum sealer would allow you to vacuum seal any type of food you wanted with minimal fuss. Doing so may well be worth the price tag. But, if you don’t want to invest like that, external models and zip lock bags are still viable alternatives. The final important tool is something to sear your food in. The nature of sous vide means that it cannot possibly brown the outside of meat or anything like that. Instead, many people choose to sear their food after it has been cooked (depending on what you’re making, of course). This is particularly relevant for cuts of meat, as you will often want the outside to be brown and crispy. This also gives you a chance to add flavor like garlic, rosemary, and extra salt and pepper according to your taste. For example, you might cook a steak via sous vide to get it medium rare and then briefly sear it in a frying pan. This would allow you to get a perfect steak each time, without having to guess and check. Doing so also means that you don’t risk burning the steak, as you only have to sear for a minute or less on each site it rather than needing to cook it. The simplest option for searing food would just be a regular skillet, which should already be a part of any kitchen. However, if you want to create better food overall, it may be worth investing in a cast iron frying pan. These are well-known for producing superior results, especially once you get the hang of using one. In some cases, people even turn to blow torches as a way of quickly searing food. This method may not be relevant to most meals but it is an interesting alternative and is certainly worth trying. There are other options too. The idea here is to simply think about how you would want to finish the meat. Realistically, you probably already have the answer in your kitchen anyway. You can also try the Searzall which I talk about in this post. So in reality, you probably already have a pot, a pan, and some ziploc bags. All you would need would be an inexpensive immersion circulator! The price ranges from about $75 to $250.